Publisher: Mitchell Repair Information Company, LLC. Get 5 One-Week Subscriptions only $8.99 each! Note: Activation Codes & Registration Instructions are sent to you by e-mail WITHIN 10 TO 20 MINUTES after check-out. Be sure to turn off your spam blocker before checkout. If you do not receive your code within 20 minutes please call us. DATA CONTENT: eAutoRepair includes complete OEM Factory Procedures, Specifications, and Exploded View Illustrations in all categories. Before purchasing, please take a moment to read what is not currently covered in eAutoRepair. 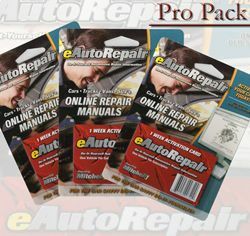 Because this product is designed for the "Car Savvy" auto enthusiast and deals only with the mechanical repair and service, the following subjects are among those currently not aligned with the intended use of this product and are therefore NOT covered: Body & Collision Repairs, Headlight / Tail Light Replacement. Windows & Regulators. Door Panels, Locks & Latches. Mirrors, Glass, Wipers, Filters R & I, Spark Plugs and Wires R & I, Radiators & Thermostats R & I, Non-Standard Parts.